The hot summer in Austin continues. Daytime temperature are above 100F (38C) and even at night it doesn’t drop below 80F (26C). It’s the time of the year that I try to spend as little time in the kitchen as possible. On the other hand, unlike many of my friends, my appetite never decreases despite the heat. 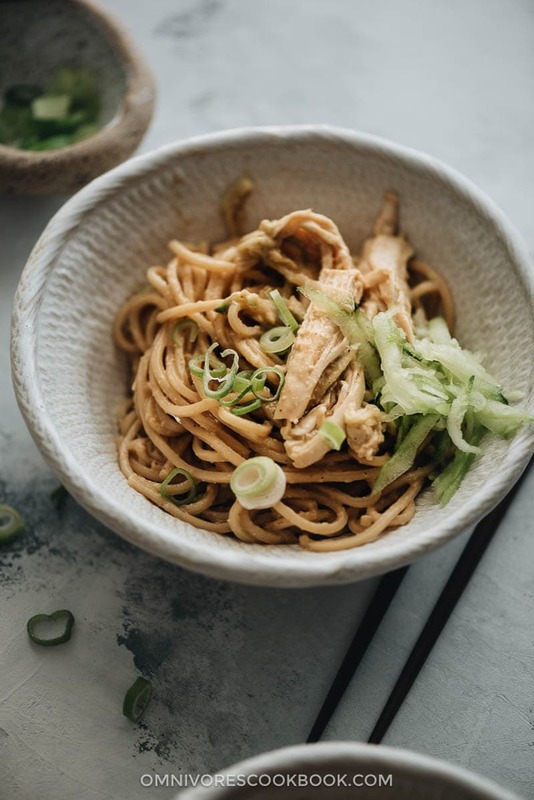 That’s why I’m sharing this delicious chicken noodle salad recipe, which is perfect for summer. 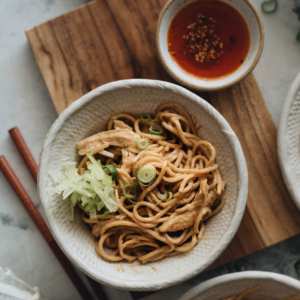 The secret ingredient that will make your noodle sauce 10 times better. It is fresh, made with quality ingredients, and tastes much more fragrant than the bottled chili oil. Making the oil takes as little as 10 minutes and the result is so rewarding. I usually make a big batch and store it in the fridge. It stays good for months. Also called black vinegar, it is made from various grains and aged until the color turns dark brown or inky black. It has a fermented, malty taste and woody character that distinguishes it from the light-colored and fruity rice vinegar. Consider this ingredient the balsamic vinegar of Chinese cuisine, as it has a rich, pungent, and tart flavor, sometimes with a hint of sweetness. You can order it from Amazon or purchase in an Asian market. I rarely recommend replacing Chinkiang vinegar with another ingredient, unless you want to make the sauce gluten-free. In this case, you’ll need to use rice vinegar, and the taste of the sauce will slightly change. You can poach the chicken, and the process for that is included in the recipe below. But you can save even more time by using rotisserie chicken or leftover grilled chicken. You can use many types of noodles to make this dish. If you like a chewy texture, use Udon, or even better, fresh hand-pulled or shaved noodles. If you like thin, tender noodles (the dish will feel more saucy this way), use Japanese somen noodles. 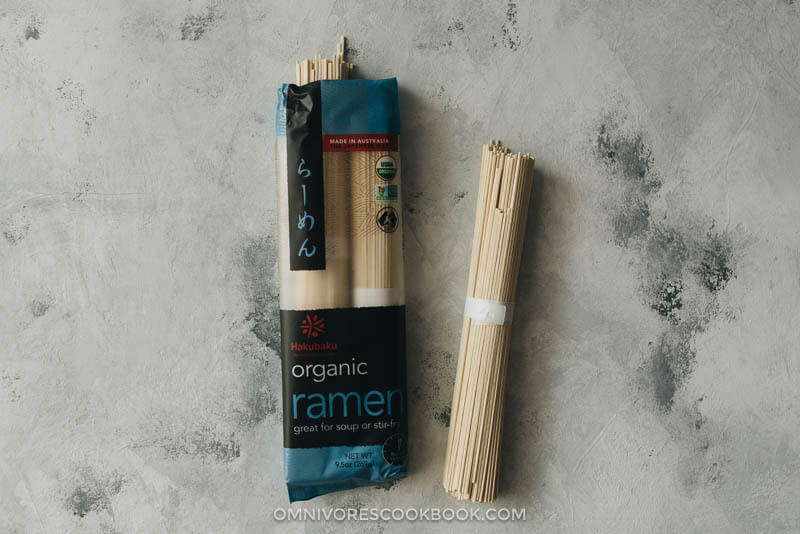 I used ramen noodles in this recipe, which gives you a slightly chewy texture. You can use rice noodles to make the dish gluten-free, or even zucchini noodles to make the dish paleo-friendly. The default noodle topping in my family is always sliced cucumber. But you can use many other veggies or skip the veggies altogether. Great topping options include sliced bell peppers, bean sprouts, thinly sliced radishes, and shredded lettuce. Once you’ve gathered all the ingredients, it takes a couple minutes to boil the noodles and whisk the sauce in a blender. You can serve the noodles as an appetizer or snack, but I could always devour a big bowl of them for dinner! Add the chicken breast into a small pot and add water to cover for 1 inch (2 cm). Bring to a boil and turn to medium-low heat. Simmer until the chicken breast is just cooked through, that the juice runs clear if you pierce the thickest part with a knife, 15 to 20 minutes. Plunge the chicken breast into ice water immediately to stop the cooking. Drain the chicken and set it aside to cool. Cook the noodles according to the directions on the package. Drain and set aside to cool. Blend all the sauce ingredients with an immersion blender or a food processor, until it forms a silky paste. If you don’t have a blender, finely chop the garlic and ginger, then mix all the sauce ingredients in a bowl until it forms an even texture. You can store the noodles in an airtight container for up to 2 days or serve immediately. To assemble, add the cooked noodles and chicken in a large bowl. Add the sauce. Toss to mix well. 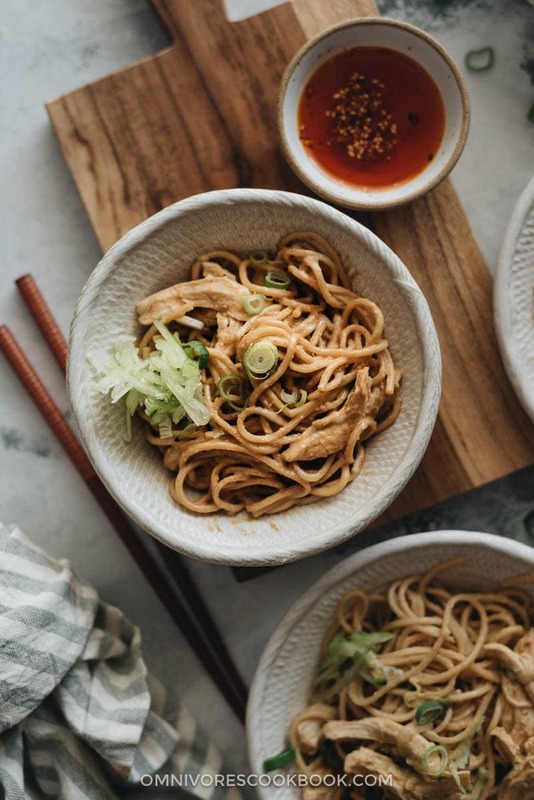 To serve, transfer the noodles into individual serving bowls. Top with cucumber and green onion. Serve cold. 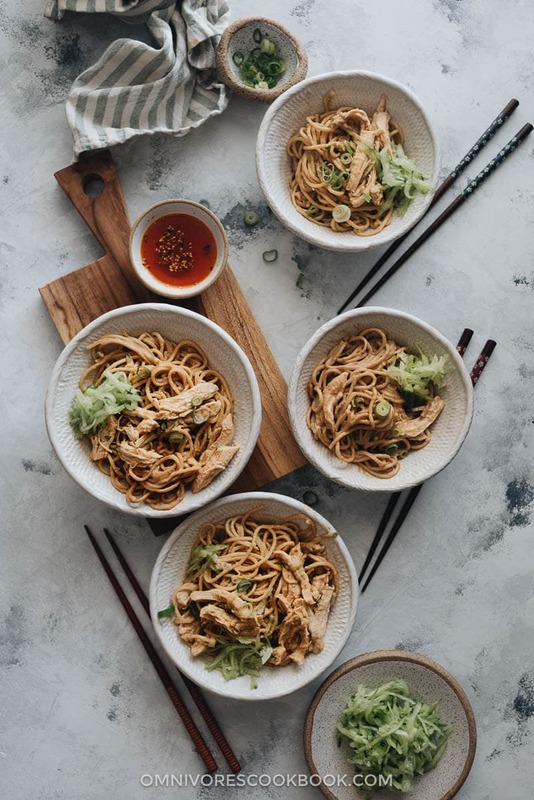 To make the dish gluten-free, replace the light soy sauce with tamari or coconut amino, replace the Chinkiang vinegar with rice vinegar, and use rice noodles instead of wheat noodles. You can use many types of noodles to make this dish. If you like a chewy texture, use Udon, or even better, fresh hand-pulled or shaved noodles. If you like thin noodles (the dish will feel more saucy this way), use Japanese somen noodles. You can use rice noodles to make the dish gluten free, or even use zucchini noodles to make the dish paleo friendly. If you use a mandoline to slice the cucumber, gently squeeze water out the cucumber before adding them to the bowl, so the sauce won’t get watery. The recipe was published on Aug. 1, 2013 and updated on Aug. 3, 2018. Thanks Sophie! This is a simple dish but tastes really good! I discovered black vinegar a couple years ago and fell in love. It has such a wonderful flavor I love to use it on dumplings! This salad is perfect for the heat wave we’re having in CA too (it’s not texas heat, but it’s pretty hot).